Another great historical novel from the Thoenes. I am enjoying this historical fiction series - especially how the authors flesh out well known bible stories and bring their own unique spin on what may have happened. The last book was a flashback to Yeshua's (Jesus) childhood, while this one returns to his last days and focuses on His healing ministry. The story is told by a recurring character named Peniel the Scribe who was born blind and was healed by Jesus. He is one of Jesus's followers.The book chronicles the deception and conniving of the Jewish religious leaders who did not believe Yeshua was the Messiah and who were trying to trap him and convict him of blasphemy. Specifically, it portrays High Priest Caiaphas and his nasty secretary Ra'nabel ben Dives. Ben Dives finds a journal chronicling the birth of the Anointed One, the murder of the babies, and a cryptic note at the end saying "but he escaped". Ben Dives plots to turn that news to his own advantage as he realizes the present day "healer" must be the baby spoken of in the journal. This book also details the concern of Yeshua's followers and friends for His safety at this time. BUT the truth of His message escaped them all as they try to protect Him.The 1st healing portrayed is of Abel, the son of Eve and Absalom the Scribe. The 1st two chapters describe his young life as being neither strong nor healthy. Then he dies at the age of 13, and Jesus brings him back to life. The rest of the book fleshes out the story of El'azar (Lazarus) and his sisters Miryam (Mary) and Marta (Martha) who were close friends of Yeshua. The unique spin here is how Lazarus becomes sick and dies. Ben Dives brings a plague (diphtheria) to the street urchins called Sparrows. He's hoping Yeshua will show up and heal them. Then he will be captured and jailed. But El'azar, Peniel, Miryam, and her servant Tavita feel compassion for the orphan boys when no one else will go near them and use their resources to help heal them. The religious leaders hear they are praying for Yeshua to heal the boys, and they spread the news that the boys are being healed by witchcraft. El'azar is the only one of the four who has not been exposed to diphtheria in the past, and you guessed it - he gets it and dies. If you have read the bible I'm not giving anything away here - Yeshua resurrects El'azar after he has been dead four days.The authors are superior at capturing the descriptions of the people, places and culture of the time. Diphtheria is more than adequately described here!!! They are also great at blending historical facts and characters with fictional ones but remaining true to scripture. Highly recommended series. Remember: "everything means something" in scripture. **Update** I actually found myself more disappointed by this book and the three that follow than the ones I mentioned below. Even though I read this book mere hours ago, I have only vague recollections of the contents. This book did not survive the second round of the purge from my personal collection.After the extremely disappointing books 4, 5 and 6, I was pleasantly surprised with this book. It seems like this book (and the next...at least what I've read so far) was written by a different, yet similarly styled, author.I thoroughly enjoyed it. The Thoenes stuck to the Biblical storyline and did not feel the need to weigh it down with extraneous drama. I'm not a huge fan of shifting to having Peniel use first person but that's really my only complaint about this book.I hope the remaining books in the series will be more along the lines of this one rather than the first six. The entire AD Chronicles series, starting with book 1, is some of the best writing I've encountered, both in the spiritual and secular realms. Bodie's insights into Scripture are consistently deep, often deeper than what I have seen from many pastors and teachers of God's Word. The fictional details that she creates to flesh out the details of the story not recorded in Scripture seem insightful and accurate to a surprising degree. I highly recommend this book and series as the pinnacle of Bodie and Brock's work, which has all been superb in my opinion. Each book of the series (I've read 1-12) is well written and hard to set down. There is romance, passion, action, and fun. At the same time one can learn Biblical truth and insight, without even being aware of it most of the time. Enjoy. The authors have some unique takes on the events that took place during Jesus' time on earth. This book describes events during the last months of Jesus' life, showing the subterfuge of the Jewish religious leaders to try to destroy Him and His message and the concern of His followers and friends to try to save Him from destruction. I especially liked the juxtaposition of Jesus' parable about the death of the beggar Lazarus and the rich man with the death of His friend Lazarus of Bethany. The authors are good at capturing the emotions and describing the action sequences. Their use of Hebrew versions of the names and places lends an air of authenticity to the story. Looking forward to their eighth book in the series even though I already know the end of the story. Yes, I do can keep track of three books at a time. I can keep track of more then I'm inclined to do so. I love the Thoene books. I've been reading them for over twenty years now. 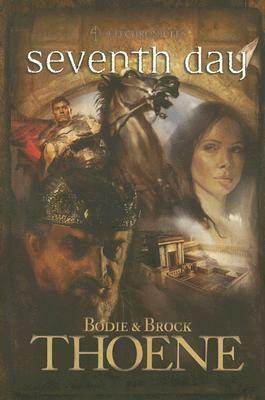 Seventh Day is book (guess what) seven of Their AD Chronicles about the life of Jesus, the people he rubbed shoulders and early Christians. I haven't gotten to far in the Seventh Day but I will let you know how it goes when I'm done. I've enjoyed the other six books and am already on page 34 of this one.I've finished this book and have also finished "The Eighth Shepherd" as well. Loved both of them. Pure Thoene. Great story, fun to read and very hard to put down. Mostly, I think I'm enjoying these books for the ways they point out how "Everything means somthing" in Scripture. They also bring to life the realities of what it might have been like to live during such a time. I'm really enjoying this series. The Thoene's do a great job of weaving story-telling with research, so everything does feel real.As usual with the Thoene's, my only complaint is the physical descriptions of some of the characters don't really jive with Middle Eastern physique's. That bugs me. The latest entry in their Biblical historical fiction series returns us to the last year of Jesus' life as everyone seems to be plotting against him. But when Lazarus gets caught up in the plot, what will happen? I enjoyed this book much better then the last one, but it's constant switching from first to third person wasn't handled well.Read my full review at Carstairs Considers. I'm not usually one to enjoy a lot of "inspirational fiction" because the genre is often so contrived, but I enjoy these authors. I like the way they mix historical facts and characters with their fictional ones. I always feel like I'm learning something I didn't know already. I can't imagine researching one of their series! They are prolific writers (which doesn't always translate to quality), but I like the way this is driving me to my Bible to check out the facts. Once again the authors do a wonderful job putting a name to characters and events that could have happened back when Jesus walked the Earth. This Seventh book chronicles the time in Jesus' ministry when the Sanhedrin had decided to arrest him up until after he called Lazarus from the grave. A great story that brings a new perspective on what could have happened intertwined with what really did. I don't know WHY in these other reviews people are saying that this was a dissapointment to the sieries. This one was just as good as the others! I love this whole sieries and I recommend it to everyone interested in biblical fiction or just ready for a change. The Theone's are very good writers! Just like the other books in this series, this book makes the people of the New Testament seem so much more real then just reading about them in the Bible does sometimes. It is so easy to forget that the people Jesus healed were just like we are today. I enjoy learning the cultural background around the stories in the Bible. The are brought to life in ways I never knew about before. Sometimes looking at something in a new way opens our eyes to see the old as something fresh and new, and we get more out of it. These stories help me do that. Seventh Day was somewhat atypical of the A.D. Chronicles. The writing style was a bit different, and the action was somewhat slower. It took me a while to get into the book, but by the end, I was cheering. This book is definitely a worthwhile addition to one's Thoene collection. I have loved every book from this series, but this one. I gat halfway through the book and was still uninterested. It was a shame because I have read almost every book written by this husband/wife team and have never been dissapointed. I will not give up on them though. I didn't enjoy this quite as much as some of the others in this series. I am beginning to wonder how many books they plan for this series. This series is just a flat read, nothing too exciting happens anymore. I liked it. I am really enjoying this series, but I am going to get away from it for a little while. I want to read something different for now, but I will be reading the 8th book soon. This book is so amazing due to all the study that the Thoene's put into it about the Jewish religion. I can't stop reading this 5 star series. This book could do with a glossary. Lots of Jewish terms. Would be nice if we knew what they meant. Love this series, and so appreciate the research that had to be done for them to be written. Of the series, this book was difficult and slow. I had to force myself through it and parts seemed to drag. Very unlike the rest of the series. Maybe I didn't give this book a chance, but I couldn't make it past the third chapter. I think this series is awesome! Of course it just follows Jesus life through the Bible and tries to make the things more real, but it does such a fabulous job. I hate when I have to put it down. This book transports you back to the time of Christ and makes you feel you are there. The series is even more enjoyable now that they are covering the period of time when Christ was on earth. Disappointingly, this one, even though Jesus is an adult (big change from the last book! ), still spends more time on Jesus's friends and only a little time on him. Still well researched. Bodie Thoene Brock Thoene - BODIE AND BROCK THOENE (pronounced Tay-nee) have written over 45 works of historical fiction. These best sellers have sold more than 10 million copies and won eight ECPA Gold Medallion Awards.Bodie began her writing career as a teen journalist for her local newspaper. Eventually her byline appeared in prestigious periodicals such as U.S. News and World Report, The American West, and The Saturday Evening Post. She also worked for John Wayne’s Batjac Productions (she’s best known as author of The Fall Guy) and ABC Circle Films as a writer and researcher. John Wayne described her as “a writer with talent that captures the people and the times!” She has degrees in journalism and communications.Bodie and Brock have four grown children—Rachel, Jake Thoene, Luke Thoene, and Ellie—and five grandchildren. Their sons, Jake and Luke, are carrying on the Thoene family talent as the next generation of writers, and Luke produces the Thoene audiobooks.Bodie and Brock divide their time between London and Nevada.